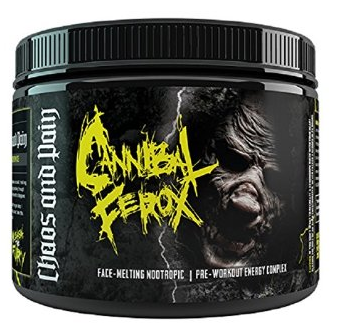 Cannibal Ferox, Version 2 or V2 for this review, is a pre workout made by Chaos and Pain. A relatively small company, Chaos and Pain has gained some attention for its lack of proprietary blends and large amounts of different stimulants and nootropics. Cannibal Ferox is known to be a very strong pwo, and many people tend to stay away from it and I don’t blame them. The website and all of Chaos and Pain’s products are dangerous looking, what I mean is they describe their products as “f*cking FIERCE” or that their products contain “maximum legal amounts” of course all this is more of a front to get people interested in the products, personally I find it very tacky and somewhat unprofessional. This does not mean, however, that their products are lackluster. There are in total 3 versions of Cannibal Ferox, v1 which contained AMP-C and is no longer sold, v2 which does not contain AMP-C and is still sold, and Cannibal Ferox Amped which contains AMP-C. This review will focus mainly on v2, with some comparison to v1. When you receive your tub of Cannibal Ferox you get this black tub with a holographic sticker with pictures of what look like demons and a very distorted logo. There are warnings and serving suggestions, which are made to make this tub look like someone that will kill you. Once again, I find it to be very tacky and all just a show. Like other pwos, it’s made into a very fine powder which clumps up but breaks up very easily. It comes with a scoop and silica gel bag to keep it dry. This is the most finely powered pwo and you really have to open it slowly or it will go all over. I have tried two flavors of this. Mango v1, Mango v2 and Lemon Lime v2. The mango v1 was absolutely the most disgusting thing I have ever tasted in my life. It tasted like a mix of 1 part mango, 1 part sugar and 98 parts motor oil. It had a very mechanical and chemical taste which made me nauseous and left my mouth very dry. There were times where I could not finish it, or even threw up because of how bad it was. V2, is much better. I found Mango v2 to be tolerable but very very sweet and mildly nauseating but not a big deal. Lemon Lime v2 was even better, and it’s what I would recommend. It didn’t taste great, but I did not make me nauseous or anything, like I stated in other reviews your best bet is to go with lemon lime flavored products. The mixability is great, it’s a very fine power and begins to mix right on contact with water. It does leave some precipitate in the bottom but they are flavorless and break up easily. The ingredient profile I will talk about will be about the new version or v2, as v1 is no longer in production. V2 contains many different ingredients that all on their own work great. The main ingredients, or what I feel are the most important to highlight are the caffeine, yohimbine HCL, creatine, and citrulline malatate. Caffeine (450 mg/serving) is a huge huge serving, this is more than 2 servings of most caffeine pills/supplements and you really feel it. This large serving will keep you energized for hours, however you should make sure you get a lot of water as you will dehydrate quickly. Yohimbine HCL (3mg/serving) is a bit over 1 serving of Yohimbine HCL at 2.5mg although many people take 5mg+. Yohimbine HCL is commonly known for its treatment of ED, but for bodybuilders it’s known for its fat burning properties, as well as some energy and focus and dilation of blood vessels. The next ingredient, Creatine, has recently become infamous in the eyes of the media and concerned parents who are worried that their kids taking creatine will kill them. Creatine is not a steroid, or an illegal supplement. Creatine simply provides some energy to the replenishment of ATP. This leads to minor boosts in energy, repair and some water retention. Creatine is just a good supplement to take and has almost no side effects. Unfortunately Cannibal Ferox only contains 2000mg, while the recommended daily servings is 5000mg. The final important ingredient is Citrulline Malate has several properties that make it a very useful supplement to take. It increases NO production, reduces lactic acid and replenishes ATP. What does this mean? Increased NO production dilates blood vessels, increases blood and oxygen flow throughout the body. Reduction of lactic acid means you will fatigue less, the buildup lactic acid is what causes pain or that “burn” we feel during our sets. With less production of lactic acid we can work out longer, harder and faster. And just like Creatine is helps replenish ATP which gives a small boost in energy. Citrulline Malate is becoming a very popular supplement, and Cannibal Ferox was one of the first to cash in on this supplement. When it comes to effectiveness, I don’t think any other legal supplement will be able to match the power of Cannibal Ferox. One scoop will give you energy, focus and increased strength for up to 6 hours. After taking one scoop every day 15 minutes before my workout, I have not seen any increase in tolerance or decrease in effectiveness. Cannibal Ferox v2 kept me level headed and energized for hours. Unlike other strong pwos which make you want to destroy the gym and flip cars, Cannibal Ferox kept me very goal orientated and confident in myself. This was a feeling I loved, it meant I was able to challenge myself much easier, leading to increase in numbers. This is the only pwo I have taken and felt like this. However, it can be too effective. You have to be very careful when taking cannibal ferox because it’s very easy to take too much. Now, I don’t mean you will overdose, which is possible if you take a very large amount, but you can feel too anxious, restless, your heart will beat quickly and this will last for hours. I would not recommend taking this 4-6 hours before you plan to sleep. That means those people who work out at night would have trouble falling asleep after using this. There have been times when I used it around 8PM and I could not fall asleep until 3AM. It’s a horrible feeling, so you must be smart with your dosing. Cannibal ferox is sold on the chaos and pain website for 57.99 but it almost always marked down to 39.99, which seems like it’s on a permanent discount. For what you get, it’s a great deal. Each tub contains 40 servings, so it’s $1 per serving but considering that ½ scoop would be okay for most people it’s more like 80 servings. You get a bunch of great stims in one package and I don’t think there’s anything else like it on the market that’s as good of a deal. Overall, I think this is the best pwo on the market. It’s got a bit of a bad rep being too crazy, but as long as you know what you’re doing you can maximize its effectiveness. This is the only pwo that I have ever purchased more than once, 4 times actually. Although I currently don’t use it as you do feel pretty crappy after 3-4 weeks of use, I always keep it in my bag just in case I need. I would give it a 9.5/10 only taking off .5 for how crappy it makes you feel after several weeks of continuous use, however, this is common with almost all pwos. Click here to get Cannibal Ferox on Amazon.com with all discounts automatically applied.